The accounting cycle, also commonly referred to as accounting process, is a series of procedures in the collection, processing, and communication of financial information. Financial information is presented in reports called financial statements. But before they can be prepared, accountants need to gather information about business transactions, record and collate them to come up with the values to be presented in the reports. 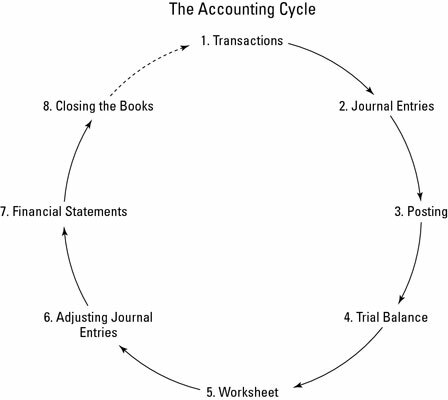 The accounting cycle has eight basic steps, which you can see in the following illustration. These steps are described in the list below. Financial transactions start the process. Transactions can include the sale or return of a product, the purchase of supplies for business activities, or any other financial activity that involves the exchange of the company’s assets, the establishment or payoff of a debt, or the deposit from or payout of money to the company’s owners. The transaction is listed in the appropriate journal, maintaining the journal’s chronological order of transactions. The journal is also known as the “book of original entry” and is the first place a transaction is listed. The transactions are posted to the account that it impacts. These accounts are part of the General Ledger, where you can find a summary of all the business’s accounts. At the end of the accounting period (which may be a month, quarter, or year depending on a business’s practices), you calculate a trial balance. Unfortunately, many times your first calculation of the trial balance shows that the books aren’t in balance. If that’s the case, you look for errors and make corrections called adjustments, which are tracked on a worksheet. Adjustments are also made to account for the depreciation of assets and to adjust for one-time payments (such as insurance) that should be allocated on a monthly basis to more accurately match monthly expenses with monthly revenues. After you make and record adjustments, you take another trial balance to be sure the accounts are in balance. You post any corrections needed to the affected accounts once your trial balance shows the accounts will be balanced once the adjustments needed are made to the accounts. You don’t need to make adjusting entries until the trial balance process is completed and all needed corrections and adjustments have been identified. You prepare the balance sheet and income statement using the corrected account balances. You close the books for the revenue and expense accounts and begin the entire cycle again with zero balances in those accounts.